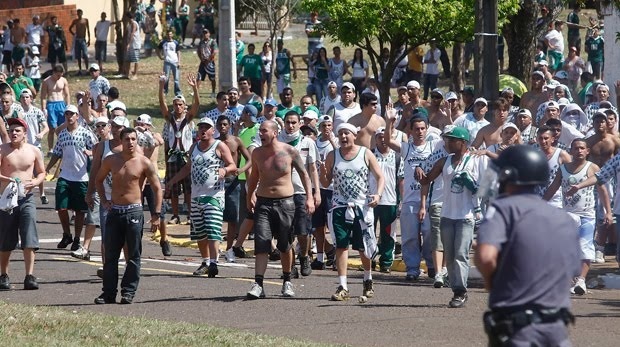 The always relevant Verdazzo published an important piece last Wednesday, exposing the perils Palmeiras supporters might face on their way to, during and after the away game against Santos at Vila Belmiro this coming Sunday. Summing up the situation: after the 2013 incident at the airport in Buenos Aires, Palmeiras president Paulo Nobre cut all ties with the Mancha Verde supporter group. Not that it had any effect on the presence of the Mancha at stadiums (and not that it was intended to have any effect): home games were never a problem due to the large amount of tickets available, and for away games the MV normally secured the amount they needed by different methods – some of them acceptable and others not so much. That’s the way it is and has been for quite some time. Well, times they are a changing. After the ruckus during distribution of tickets to the Corinthians vs. Palmeiras clash a few weeks back – where queues outside and inside the club got completely out of hand – the Palmeiras administration has taken an innovating step further in the strengthening of the Avanti membership programme: provide tickets to important away games based on Avanti member’s rating. It’s fairly simple: records are kept on Avanti member’s stadium visits and compiled into a ranking. Against Santos, 700 tickets have been made available for the visiting team. Palmeiras have bought them all and sent an e-mail to the 700 highest-ranking Avanti members, offering them a ticket each at a fixed price. Unsold tickets are advertised a second time to the next set of people on the ranking. Any unsold tickets after he second round will then be made available on a first-come-first-serve basis, Avanti member or not. The initiative is worth all the praise, as it effectively rewards those who work the turnstile the most. At least, as long as these are Avanti members. And there’s absolutely no reason they shouldn’t be. Be they Mancha Verde or not. Now, going back to the Verdazzo text, there’s a genuine and legitimate concern for the safety of those 700 palmeirenses heading for the Vila Belmiro. For the first time in ages, there’s no telling how or even if the Mancha Verde will be present. That will have implications on how much chanting and support the relatively small Palmeiras section will be able to convey to our players. Equally or more important: it will have implications on how much protection will be available for our supporters. The Verdazzo convincingly argues that, unless preventive police work is flawlessly executed, the risk of a disaster is overwhelming, as Santos supporters are likely to take advantage of the situation. “It will be the ultimate test to whether Paulo Nobre was right in maintaining an inflexible approach [toward the Mancha Verde]”, Cacace concludes. But that last sentence is where this space and the Verdazzo will differ. Perhaps in part because I’m not much familiar with the stands, having been to few home games and even fewer away game. In the eyes of some, that alone might be enough to disqualify my opinion entirely. On the other hand, the distance might be what allows me to maintain my focus on principle, even under pressing circumstances like these. Nobre cut ties with all organized supporter groups based on the principle that physical aggression is incompatible with the society we want to live in and the club’s philosophy. How cynical would it not be if he initiated a rapprochement with the Mancha Verde because Palmeiras, in a sense, need their services as storm troopers, need their protection? S.E. Palmeiras must do what it can to cater for the supporters’ basic needs, but protection is not one of those: that’s for the authorities and the police to handle. Certainly, Palmeiras should be in constant dialogue with authorities, with the police, and cooperate as much as possible with the aim to increase security for everyone involved. However, at the end of the day, the buck stops with the authorities, with the police. To lay blame on Nobre for what eventually might go wrong in Santos on Sunday is illogical and inconsistent. UPDATE: Less than an hour after the publication of this text, three people trashed the Avanti ticket booth in an act of dissatisfaction for “only” be allowed one ticket each: they wanted 90 tickets out of the total 700 and presented the money. When denied the extended purchase, they attacked the vendor and destroyed equipment and furniture. Palmeiras responded by suspending the selling of remaining tickets. Full cooperation with the police is expected in a joint effort to identify the perpetrators and bring charges against them. President Nobre issued a firm statement in the afternoon, making clear that the club’s policy remains firm, that Avanti will be the mechanism through which supporters preferably will get their tickets, and that Palmeiras will not bend under pressure. At this point, there are no information on whether the perpetrators would be members of any of the organised supporter groups. I must say NONE. He cannot be accountable for any violence that might take place on the streets. This subject is reserved to the state police (to the public force) by the Constitution. Brazilians have a hard time telling responsibilities. I agree completely, Marcos. Completely.